Ideal for highlighting focal points and can be used in and out of water. 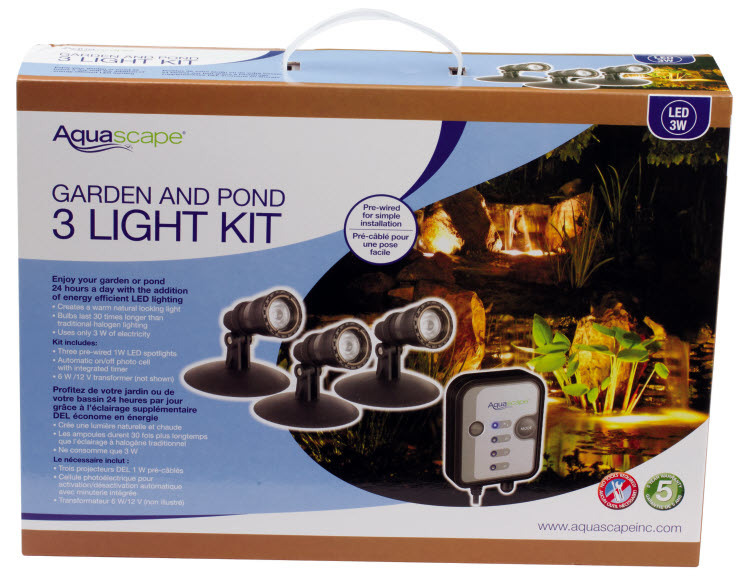 Aquascape Pond and Landscape Light Kit includes everything needed to create a beautiful nighttime focal point in any water garden or traditional landscape. The small compact design allows for installation in even the tightest spots. Features:. Pre-wired for simple installation. Long bulb life. Can be used in or out of water. Will not overheat when being used out of water. Will not heat pond water. Contemporary look. Timer and photocell and transformer included. Includes: Includes:. 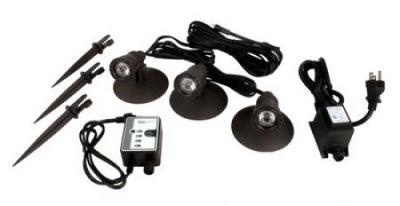 3 1-watt LED lights. 1 Transformer. 1 Photocell. 1 Stand and 1 Soil Spike. Weight: 4 lbs. Size: 1.25 Diameter x 2.75 L.